When your body’s immune system over-reacts or responds abnormally to irritants like animal dander, pollen, mold, drugs or dust, or even to some foods, it is called an allergy. Allergic reactions could be as varied as rashes, itching or swelling of mouth, lips or tongue, difficulty in breathing, running nose, sneezing, vomiting, diarrhea or even low blood pressure. 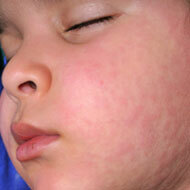 Toddlers also have common allergies caused by similar irritants. But it is more frightening because children do not have sufficient strength. How To Treat Toddler Intestinal Flu?